You Guys are Extremely Good at What You Do!! You guys are the greatest! I just wish I could find someone else with an IRS debt too big to handle. Rather than referring them to you, I think I'm gonna put them in my car and drive them over to yall's office!!! You guys are extremely good at what you do. The Entire Staff Was Incredibly Knowledgeable! I had an IRS tax levy and didn't know where to turn. I knew I didn't owe what they said and didn't know what to do. Then I heard Bryson Law Firm's radio commercials. I called for an appointment right away! I first talked with Cary Bryson and he told me how much it would cost for each of the 3 levels of help they offered. He then explained what would happen once I signed on with them. And that was exactly how it went. Bryson Law Firm, LLC stopped the wage levy and filed the back taxes for the years I hadn't filed. My case manager, Jennifer, was especially helpful! She was very understanding and had an answer for every question I asked. The entire staff was incredibly knowledgeable and will take the time to explain every step to you. I have already told some of my friends and family about the help I have received and told them to call Bryson Law Firm, LLC to see what they can do for them. The informative website and the fact that it was local led me to choose Bryson Law Firm L.L.C. They steered me in the correct direction and were very knowledgeable and insightful about my situation. My previous experiences with the IRS left me wanting. It seemed like they changed their minds every quarter. 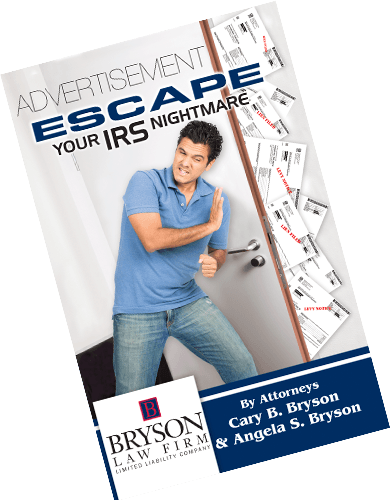 With Bryson Law Firm L.L.C., I did not have to talk to the IRS! They gave me personalized service and returned my calls and emails in a timely manner. I never felt "left out in the cold" so to speak. Keeping the client in the know is one of their strengths. I hope Bryson Law Firm L.L.C. continues on its path of helping clients with IRS problems. I have already recommended them to all of my friends! I Could Tell He Genuinely Cared About Helping Me! After hearing a news broadcast about the Bryson Law Firm, I knew I had to call. I had never had a problem with my taxes before and didn't know where to turn. The staff was very VERY knowledgeable and took the time to help me understand what I needed to do. Mr. Cary's expertise walked me through the necessary steps. I could tell he genuinely cared about helping just an average person like me. If anyone ever needs tax advice I would feel very comfortable referring them; I know they would be in great hands. I Have Already Recommended the Bryson Law Firm, LLC to all of my friends and other colleagues! 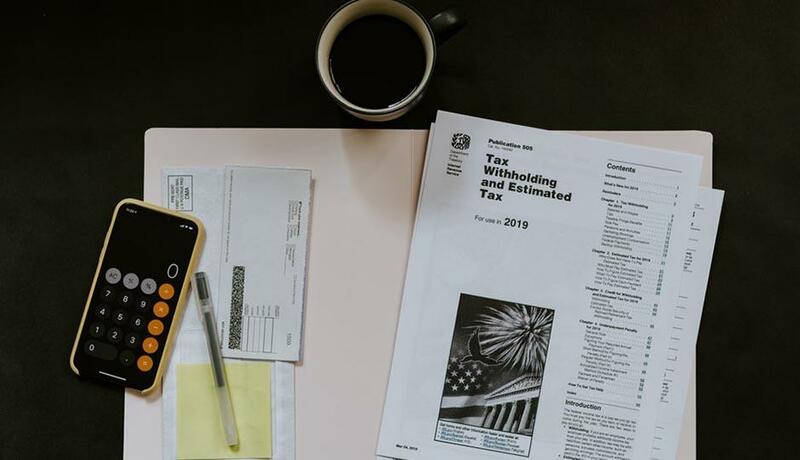 After dealing with JK Harris and Associates, many of my clients recommended that I choose Bryson Law Firm, LLC to help me with my tax problems. They were knowledgeable and helpful in giving me options to choose from in getting the IRS off my back. The initial meeting was "matter of fact" and I understood what I needed to do and what the Bryson's could do. The service was great. I have already recommended the Bryson Law Firm, LLC to all my friends and other colleagues. I do appreciate your services to me. You can't find anyone better than Bryson Law Firm, LLC. They did a great job and were very business-like and courteous. I have worked with my other law firms over the years and have never worked with anyone better or had greater results! I have recommended and will recommend Bryson Law Firm, LLC to anyone. Everyone did a great job and I appreciate all they have done for me! When my husband and I realized the depth of our problem with the IRS, we decided we needed the best attorney to help us get our life back. That's when we found the Bryson Law Firm. Not only did they provide the knowledge and expertise, but they communicated with us every step of the way, which gave me peace about our situation. Cary and Angie Bryson were confident in their ability to help us – and they did! They were able to get our tax debt reduced from $15,000 to $589. Not only did they solve our tax problem, they helped us become more knowledgeable about taxes and the IRS. We are truly thankful for what Bryson Law Firm has done for us. God bless you!! I was looking for someone who could 'specialize' in tax resolution. I did not want a 'general' tax attorney. Bryson Law Firm was able to help me see the big picture and they were able to simplify it for me so I could understand. They were straight forward, helped me grasp the issue, and used a procedure that resolved my tax problem in a concise manner. I feel they really went to bat for me. I am telling everyone about Bryson Law Firm! I was referred to Bryson Law Firm by a trusted friend. At my first appointment Cary Bryson put my mind at ease because he actually had a plan and was looking out for my best interest. I really appreciated the fine on-going service provided by the staff. Each person always knew about my case and I never worried about the ball being dropped. I tell everyone I know about Bryson Law Firm and how really wonderful they are!! A short internet search generated mostly national tax resolution groups, but I wanted someone in Louisiana. I was glad my search led me to Bryson Law Firm. They provided me with insightful options that definitely reduced my overall obligations. Their strategy with closing down my business was excellent and the outcome with my other company was exactly what was hoped for. I enjoyed the face-to-face meetings as that was important to me. I have only good things to say about the Bryson Law Firm. 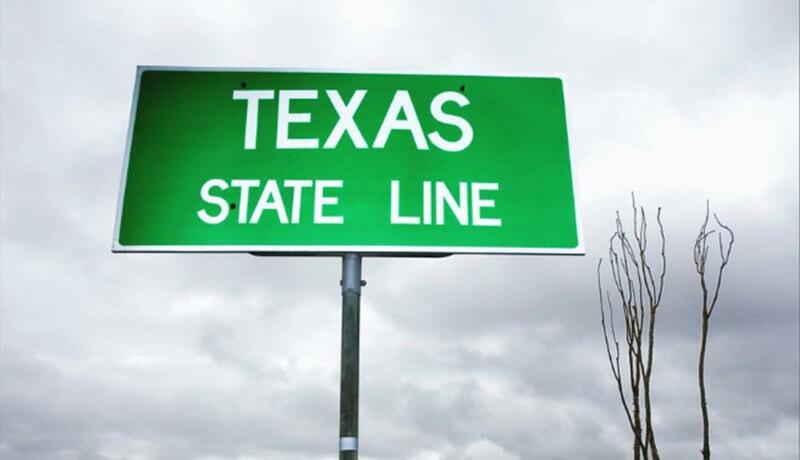 I had hired other out-of-state tax agencies but dealing with them was too time-consuming. Then I saw that the Bryson Law Firm was local. Everyone was very personable and filled in the gaps of my tax knowledge. I had been dealing with this situation for 10 years. I had carried the burden throughout my bout with cancer. Because of this tax situation, I was unable to plan for my future and it had jeopardized my retirement. But the Bryson Law Firm was able to arrange a payment plan for me. Now I am very happy this tax problem is behind me. I searched the internet looking for a tax attorney in Shreveport, but found the Bryson Law Firm website and called for an appointment. The staff always answered my questions and helped me with an Offer in Compromise. When there was a problem in communication with the IRS, Angie Bryson was on the phone to make it right! I would refer anyone to call Bryson Law Firm to resolve any tax issues they may have. I Went From Owing Nearly $100,000 to Receiving a $28,000 Refund!! I had heard that the Bryson's were honest and great people to deal with. They really took care of me!! Bryson Law Firm was very patient with me, explained the procedure for dealing with my tax situation, and told me all my options. I really appreciated being able to talk face-to-face with them instead of having to talk to a stranger from another state. They communicated with me regularly through conversations and letters. They were wonderful! I went from owing nearly $100,000 to receiving a $28,000 refund!! I love the Bryson Law Firm!! I really feel they should open offices all over Louisiana!!! Everyone needs to have access to them. I am telling EVERYBODY about Bryson Law Firm. 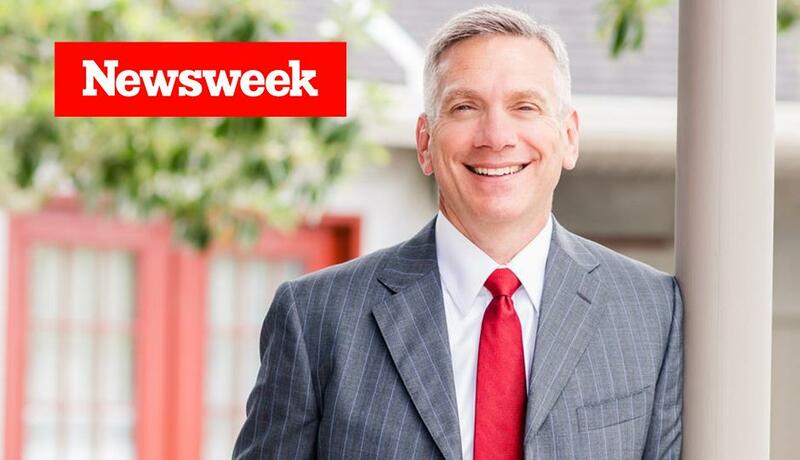 Please use my full name in this testimonial and let everyone know that I am not an actor hired to say good things about the Bryson Law Firm – I am a Louisiana boy and all of this really happened to ME!!! I received pamphlets in the mail from the Bryson Law Firm. I did some research before I called for an appointment. I was at the end of my rope with the IRS since I owed a lot of back taxes. Everyone at Bryson Law Firm was so nice to me and friendly. They did not look down on me but treated me with respect and kindness. Bryson Law Firm really came through for me – I owed the IRS $28,966.56 but they negotiated for me and the IRS settled for $586.04!!! Now I can sleep better at night and don't have to worry. I thank everyone at Bryson Law Firm from the bottom of my heart. I appreciate what they have done for me. I will keep everyone at Bryson Law Firm in my thoughts and prayers. We really liked your advertisement we received in the mail and liked the fact that your firm was local. The Bryson Law Firm staff was very helpful, friendly, considerate, and understanding. They worked with us and got our tax problem under control. We think you all are great and can't imagine how you could do any better! I Can't Think of Anything They Could Have Done Better! The Bryson Law Firm really took the load off my back when I hired them to handle my tax problem. They tirelessly answered my questions, were friendly, kind, their knowledge of taxes and the IRS was awesome, and were very professional. I can't think of anything they could have done better – it was the IRS that was the problem!! I am delighted that with Bryson Law Firm handling my case I only had to pay $427 instead of $50,000!!! I needed professional help in dealing with my tax debt. The Bryson Law Firm fit the description I was looking for. My phone calls and emails were always answered and any questions I had about my case were always answered in a timely manner. Bryson Law Firm worked to get my tax debt reduced down by approximately half – saving me over $15,000! They also cleared my name from the tax liens the IRS had filed against me. While all of this did take time, it paid off in the long run. Bryson Law Firm helped out a great deal. I could never have gotten this far without them as I would still have a huge debt with the IRS – the world's worst to be in debt to!!! The IRS had a tax lien on me and I could not get financing for a home. Now I can purchase a home of my own and get on with my life. Thank you so much!! I feel the Bryson Law Firm is the best law firm in the world!! You are knowledgeable in every aspect of tax law. Your staff is kind, courteous, patient, compassionate, and showed concern for me through my tax ordeal. I can't say enough nice things about Bryson Law Firm! I don't see how your firm can perform any better. I owed over $8,000 to the IRS but only had to pay $1,000 all because of the honest, capable, hard work of the Bryson Law Firm! I tell everybody I meet that your firm is superb and that you must be one of the most outstanding law firms in the country!! The Bryson Law Firm is very knowledgeable in knowing tax laws and how they are applied. They were quick in their response when the IRS seized my bank account - the Brysons took care of it within hours! You can depend on them to give their best effort. Please continue your caring ways and friendly, family atmosphere. You saved me money on my taxes - I owed $35,000 and settled for $7,760 - and gave me peace of mind. Thank you so much for your help!! I had a tax problem and I didn't know what to do. I wanted to do the right thing about it. Then I received a letter from the Bryson Law Firm. You explained everything to me and took care of my situation. Thank you to Bryson Law Firm because I didn't have to pay all that I owed. I appreciated what you all did for me. You are all nice people and you help in any way you can.